Other Kauai posts: Kauai, Kauai Quilting. We ate good on this trip. 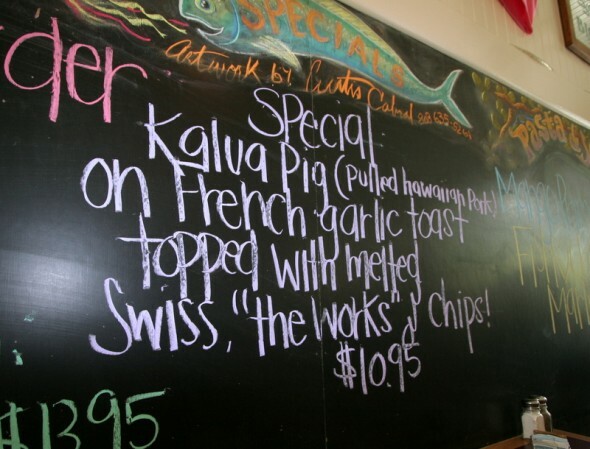 And pretty cheap; since Kauai has such a laid-back feel, we ran with it and ate at a lot of shacks (with no websites). With one notable exception, which I’ll get to. 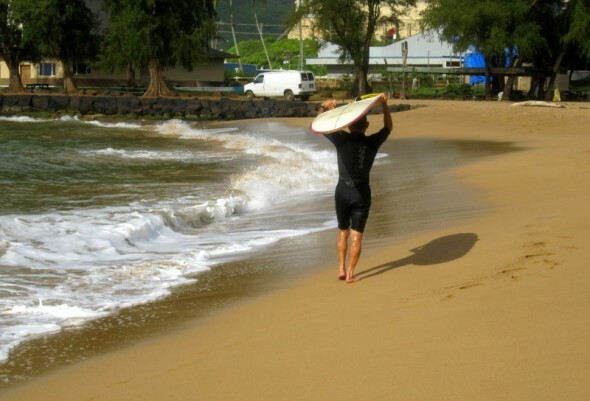 The first morning of the trip we were jetlagged and up at dawn, so we headed to the Kalapaki Beach Hut. 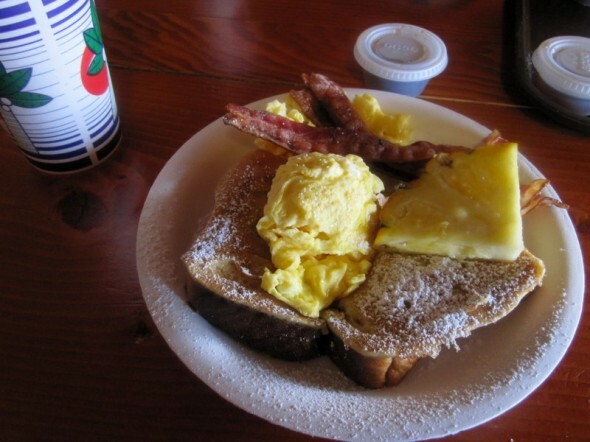 This one of our favorites, super good and cheap breakfast at a shack next to the beach. The upstairs seating looks out onto the ocean. There’s no website, but it’s just past the Marriott in Nawiliwili. And the best part was heading to the beach after breakfast, when the morning surfers were starting to come out. We went back to this one for breakfast before we left. 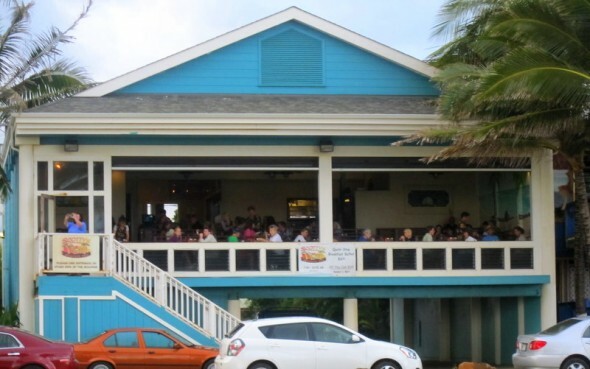 Scotty’s Beachside BBQ in Kapaa (the “Coconut Coast”) was great for an early dinner. The pulled pork and ribs were awesome, it’s open air seating, and the view was great. See that empty space on the far right, near the stairs? 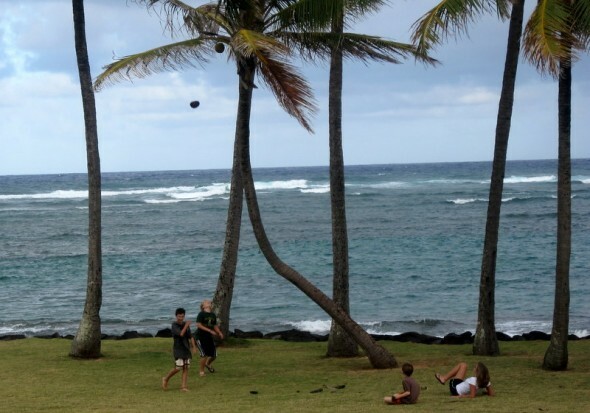 That’s where we sat, watching kids try to knock down coconuts. Not the cheapest BBQ we had on the trip, but still pretty darn good. Any place Robert Downey, Jr. likes (he signed a picture hanging on the wall) is good enough for me. 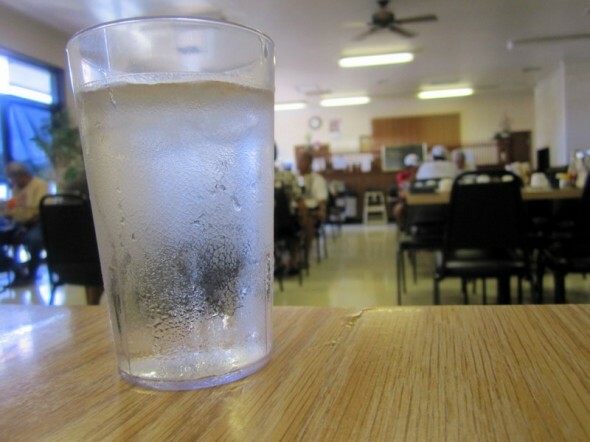 We went to Dani’s, a super bare bones local place in Lihue, for another breakfast feast. 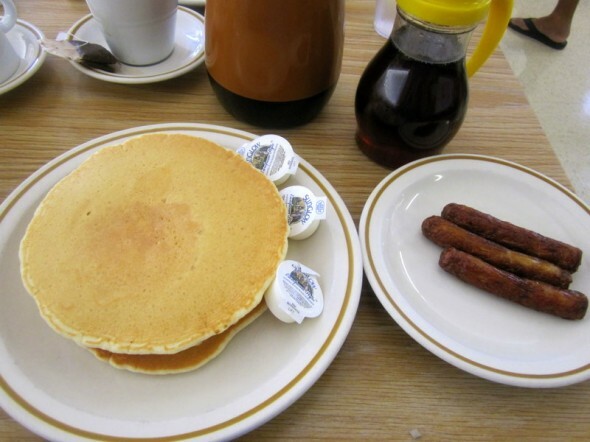 This place was fine–cheap and perfectly good pancakes. The sausage links were homemade and REALLY good. We definitely felt like visitors, though, and the Beach Hut was way better atmosphere. There’s an Italian chain on the island called Kauai Pasta, which is better than you’d think it’d be. But still not spectacular. There is a lot of Italian food (especially pizza, which ain’t so great) in Kawaii, and this was okay. 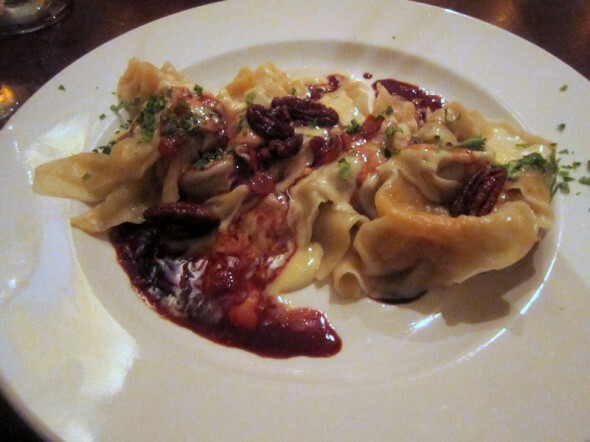 I had this butternut squash ravioli special, which had pecans, a red wine reduction, and a gorgonzola cream sauce. There was a lot going on, and I love butternut squash but wondered why it was on the menu in July. 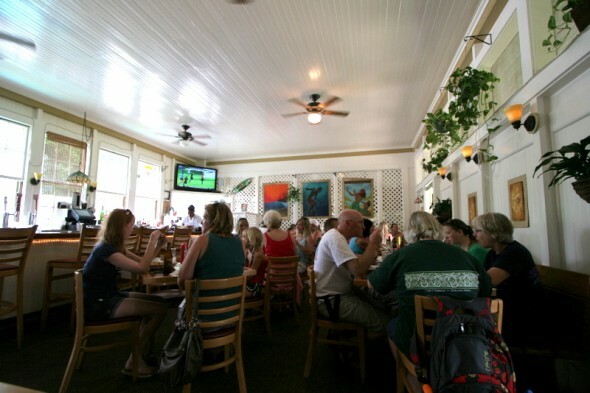 Pau Hana Bar & Grill in Kapaa was another great place for lunch. 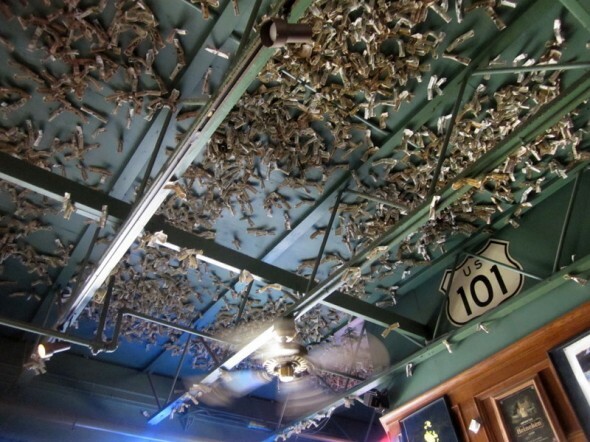 I love all these dollars stuck to every surface, signed by people who’ve come through. It’s dead hot in here, but it’s got good burgers and grilled cheese. Adam did a 5 hour photo tour one day, so I hit the spa and had lunch on my own. 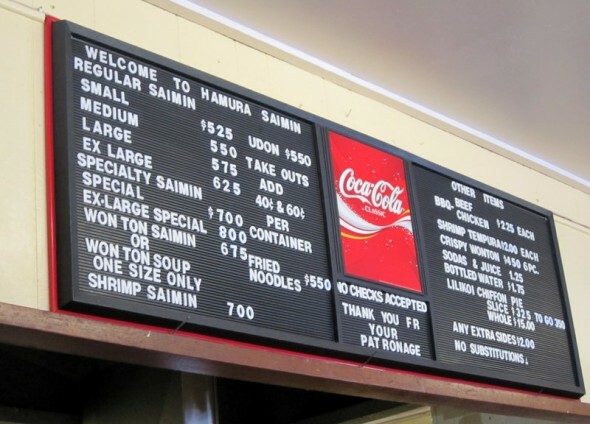 I went to Hamura’s Saimin, a legendary noodle shop in Lihue. A medium bowl of noodles (which is GIANT) and a BBQ Beef stick were less than $8 total. 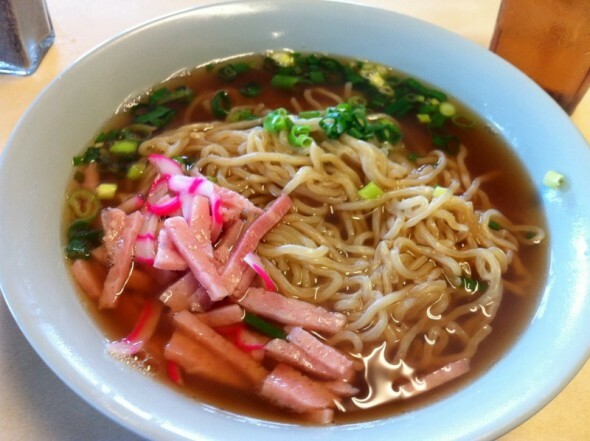 The noodle bowl is dashi broth, and the meat is Spam. Spam appears A LOT in Hawaii, and it is an acquired taste. I loved this place, but I refused a menu to try and blend in with the locals, which meant all I had to go on was this board. I had no idea what I was doing, it was so much fun. 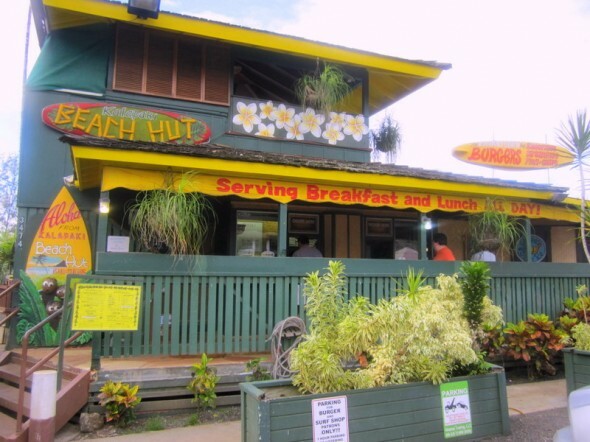 We drove up the North Shore to see Ke’e Beech, and we stopped for lunch in Hanalei. I love this town, it is just awesome. We ate at the Hanalei Gourmet, in the Old Hanalei School. 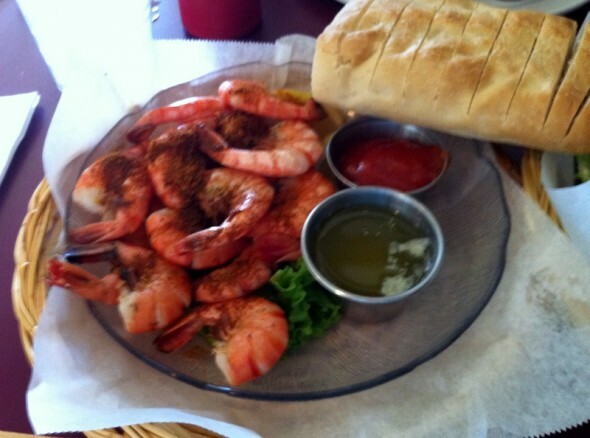 I had this shrimp boil in Old Bay broth. Just. So. Awesome. Adam had the special. 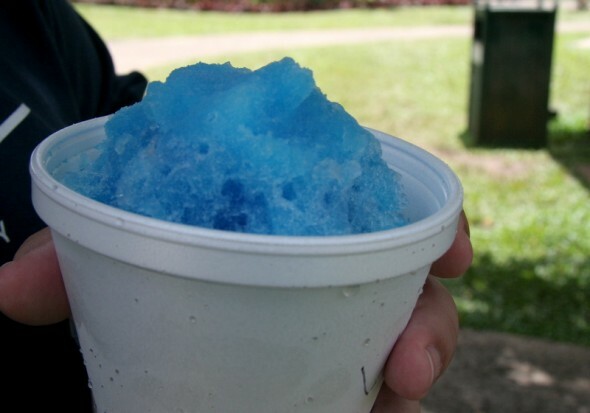 Then we had shave ice for the first time next door. We had BBQ again our last night in Kauai, and it was tons better. 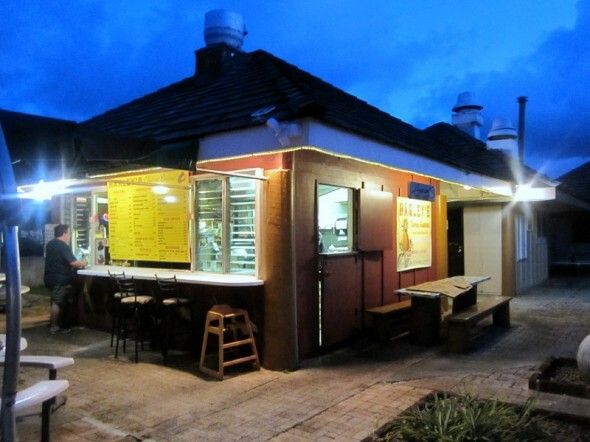 Harley’s Tropical BBQ is a stand in the middle of the Coconut Marketplace near Kapaa. It took us a while to wind through the maze of shops to find it, but when we did it was perfect. 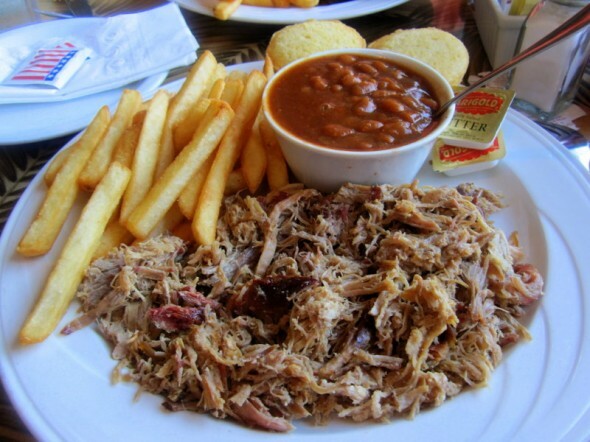 Super cheap, super good BBQ using island flavors (like papaya dressing). 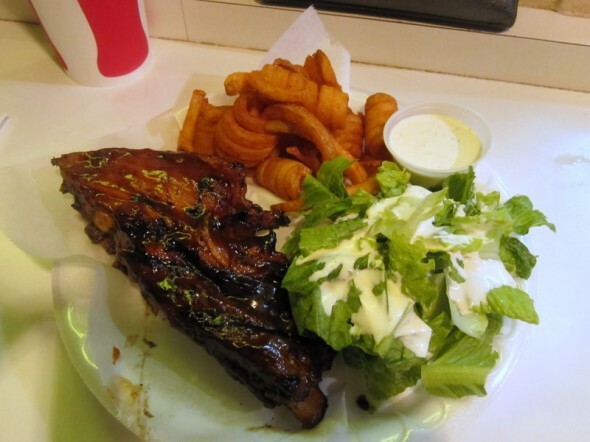 Great ribs, and curly fries, too. 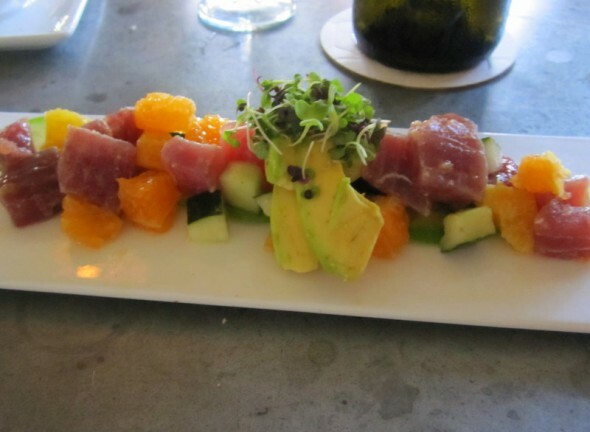 The standout meal of the week, though, was at 22 North. 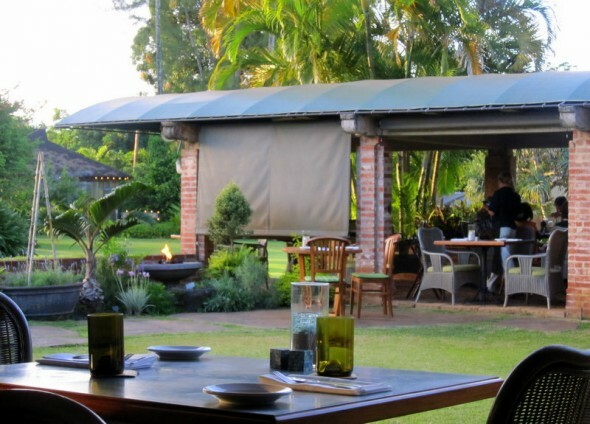 It’s a farm to table restaurant on the Kilohana plantation that replaced the well-respected Gaylords. And it was the best meal of the week. Fine dining in the kind of relaxed place where you can where flip flops. The staff was awesome, it was just good. We toured the plantation earlier in the day and saw the food we’d be eating for dinner (most of which is grown/raised right there). 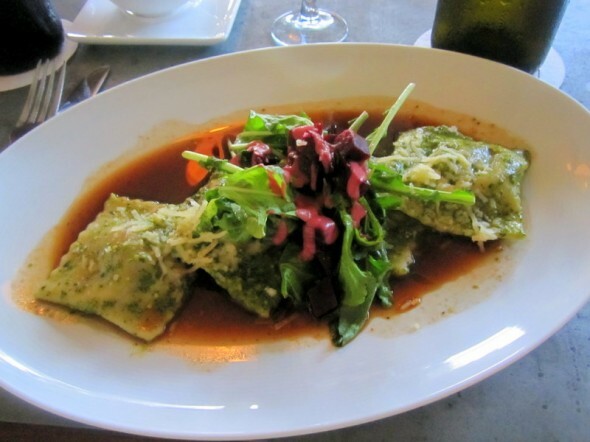 I had poke ceviche (my first poke experience), and then braised short rib ravioli. Loved it, and a special night.